I had intended to serve this as a dessert, but changed my mind in favour of a chocolate tart. 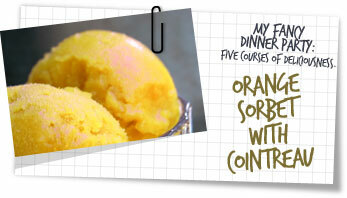 I used the sorbet as a palate cleanser course. It was a great fruity dish that really got the taste buds ready for the next installment of Stuffed Poussin with Asparagus Risotto. Bring to a gentle boil the water, sugar and orange zest then boil rapidly for 5 minutes. Cool. When cooled completely, pour in the orange juice and stir well. Strain through a seive into a plastic container then place in the freezer. Stir every hour to prevent lumps appearing. Cover the surface with plastic wrap then cover. Serve a scoop of sorbet with a tablespoon of cointreau over and a mint/basil leaf on top.